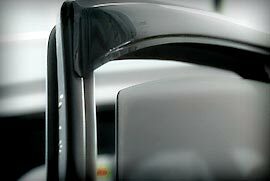 At Ultimate Window Tinting, we have 48 years of combined experience in the industry. With that kind of experience at your disposal, there’s no better place to have your windows tinted no matter what darkness level you’re looking for. Although we have been doing this for years, we are constantly refining the latest techniques to ensure quality service you can count on. Our advanced techniques allow you to get the most from your window tint. Take our borderless edges, for example. These allow your windows to roll up and down with the shaved-edge method. With one-piece rear windows, you never have to worry about any cutting on the rear defrosters. Learn more about everything our automotive tinting can do for you. The sun may make life possible, but it can be a hazard even in the best of times. That’s why we strive for the best protection available. Our films prevent up to 99 percent of harmful UV rays from bleeding through, ensuring protection for both your interior and your skin. In fact, quite a few of our tints are approved by the Skin Cancer Foundation. Protecting against UV radiation is just the beginning of what our tints can offer. They’re also designed to prevent glass from shattering. Not only will this prevent dangerous projectiles during a crash, but it functions as a deterrent to thieves who try to break into your vehicle. As if that wasn’t enough, your vehicle will also be around 30 percent cooler in the summer, so you don’t have to feel like you’re in an oven while you desperately fumble to crank the air conditioning. Please visit our Tinting Simulator tool located at the top of this page to assist you in determining what levels of tint are best for you. We always strive for quality with our services, and that’s why we use XPEL window tinting for all our work. With their high standards and widespread recognition, XPEL can offer you all the protection you need and then some. To truly understand everything it can offer, check out the XPEL difference. XPEL films are always hand drawn and manually measured and tested. This offers the durability, appearance and performance you deserve. After tinting, make sure you don’t roll your windows down for about 3 – 5 days. If you have it done in the winter, the cold weather extends that period to about 2 weeks. When it’s time to clean your windows, make sure you don’t use anything containing ammonia. That will wear down the film, rendering it far less effective. For a quick and quality tinting process, Ultimate Window Tinting has got you covered. In just a few hours, depending on your class of vehicle, you can enjoy high-quality tinting that’s stylish and protective. We’re happy to take walk-ins, but it’s usually better to make an appointment, as they take priority.